Instead of doing only finance courses or courses I have a decent feeling of what will be expected from me I sometimes pick a course of which I do not know anything yet just to broaden my horizon a bit. 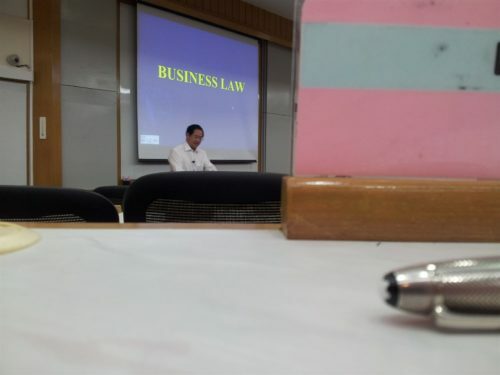 Last quarter I took one of those courses: Business Law. I have done only 1 law course before, Dutch tax law, and that was over 10 years ago so I could start this course with about as much of a blank slate as possible. 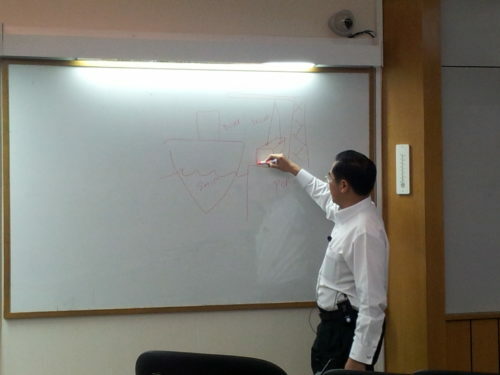 Professor Kanich Punyashthitit teaching at Sasin. What stood out about this course was that the professor, who normally teaches at Chulalongkorn University, did not hold back on commenting where the laws in Thailand were less developed or where changes were made for the worse. This seemed quite unusual since most Thai professors are careful to not critique Thailand and rather say nothing than something negative about the country. It did help us a lot though since we now better understand the weaknesses of Thai law and where those weaknesses came from. Kanich Punyashthiti explaining where responsibilities change from seller to buyer in case of FOB and CIF. Yes, that is a drawing of a boat and a crane lifting a container. Unlike other courses there was not much we could do for this course besides sitting in for lectures. There was no book available to read, you could get a law book from the library though but that would be some dry reading, and besides the handouts there was nothing. Since many details were explained during the course which were not covered in the handouts it mostly resulted in people scribbling the handouts full with remarks in the hope they would be able to recollect the important parts during the final exam. The notes I made during lectures, as you can see it does not always become clearer when you write things down. 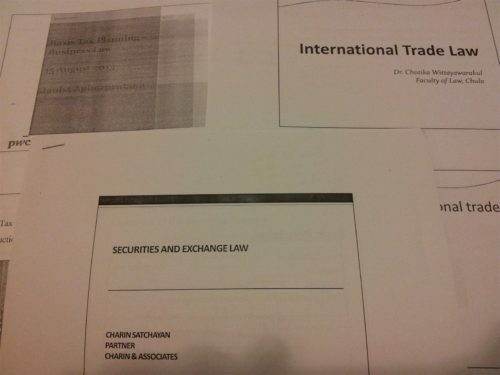 Since each part of the law can be a subject by itself the last 3 classes were filled by guest speakers who were more specialized in a certain area of Thai Business Law: securities and exchange law, international trade law, and tax law. 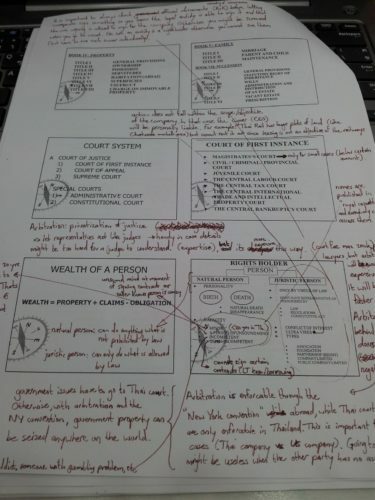 The handouts from the three guest lecturers each covering a different part of Thai laws. Unfortunately this course only has one final exam and that is it, so if something is not clear by then or you misunderstand one question you will be doomed to get a “B”. And there is not much you can do besides going over your slides one more time before the exam since there is no book available for this course. Luckily it is an open book exam though, so we will just see who made the best notes in class.